Popular for colds and flu. Take at first sign you are getting sick. 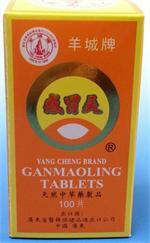 Ganmaoling tablets are a favorite remedy for cold and flu. Take them as soon as you start to feel you are getting sick or catching a cold. They may help relieve chills, fever, swollen lymph glands, sore throat, and stiffness of upper back and neck. 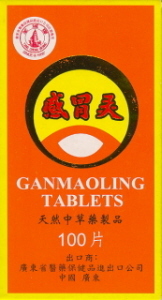 Ganmaoling are recommended to keep on hand for whenever you need them. Use 4 tablets three times a day. Note: If you are concerned about getting sick you may want to keep this product on hand. Contains: Ilex asprella, Evodia, Chrysanthemum indicum, Vitex, Honeysuckle (Lonicera), Baphicacanthus (Isatidis), Menthol. Other Ingredients: Cornstarch, sucrose, water, FD&C yellow 5 & 6 color. Yu Lin Brand. Manufactured by Shantou Olive Pharmaceutical Co., Ltd, Shantou City, Guangdong, China. Your Price: Sorry! Manufacturer is Out of Stock.